Take a break from savoury flavours and indulge in this caramelised Apple Strudel with Pecans and Cream Custard, perfect for afternoon tea with friends. Whisk egg yolks, corn flour, and sugar and vanilla seeds in a medium saucepan. Gradually whisk in the milk and cream then place the pan over a low heat and cook gently for 6-8 minutes, whisking constantly, until smooth and thick. Do not allow the custard to boil. Bake nuts in the oven (180°C) for 5 minutes and let it cool down. Chop nuts coarsely. Crush Marie biscuits but not into too small pieces. Heat butter and 100gm sugar until sugar caramelised. You can help this process with a little bit of water. Lower the heat, then add the green apples and cook for approximately 2 minutes. Add in the crushed Marie biscuits, the nuts and continue cooking for another 2 minutes so it becomes thick. You can add more biscuits or sugar according to preference. Remove pan from heat and let it cool down. Place plain pizza crust on a baking tray. 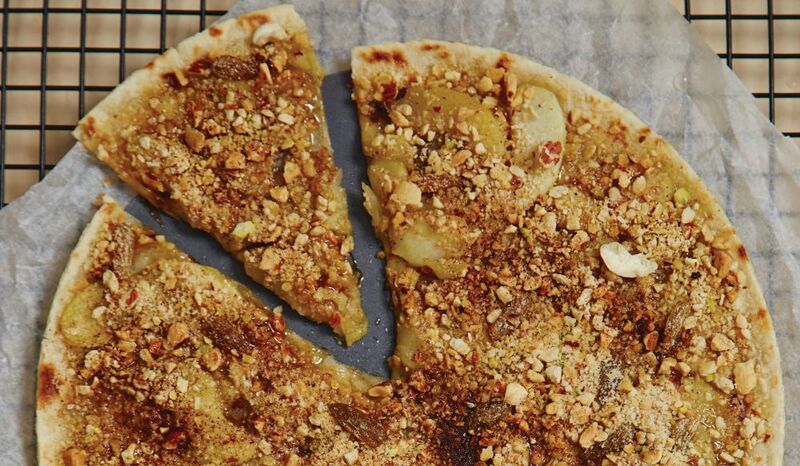 Spread the apple strudel mixture evenly over the surface of the pizza crust. Sprinkle over with icing sugar and bake in the oven (180°C) for approximately 4 minutes. Remove pizza from oven, cut the pizza into slice and serve with custard cream sauce.